Juan Duque shows his stuff and pours a latte at First Village in Ossining, New York. Photo by Rob Piersall. You think you have what it takes to sling the best latte? 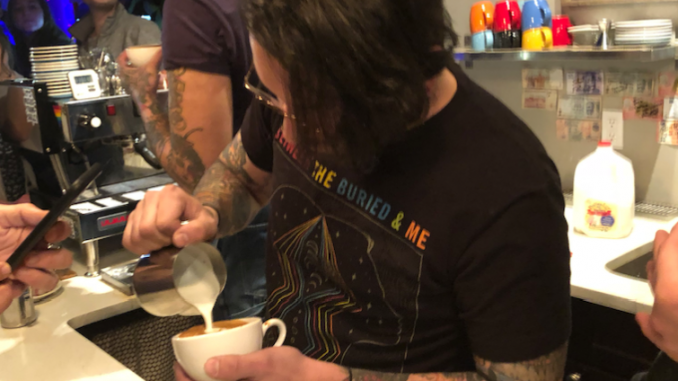 On Friday, Jan. 26 nearly two dozen baristas participated in the first annual latte art throwdown at First Village Coffee in Ossining, New York. While the event remained competitive, a focal point was spreading love and camaraderie among the coffee community. Kathryn Corena and her husband Luis are the owners of First Village. They established the coffeeshop 16 months ago and strived to bring the coffee community together with the competition. To determine the winner of each face-off, there were three judges on the panel. Whoever received the majority of the votes advanced to the next round. The event kicked off with two wild card matches for two baristas to gain entry into the main circuit. After “hearts” were thrown down and the wild card winners were chosen, the night began. The first official round was to see who made the best cappuccino rosetta. Cappuccino milk is typically thicker than latte milk, which makes latte art more difficult. A rosetta looks like a flower where you sink your milk into the espresso and move your pitcher backwards while shaking it slightly before swooping lightly through. There were 16 competitors in the main circuit, ranging from Brooklyn, Manhattan, the Bronx and Westchester. Eight competitors moved on to the second round, which was pouring tulip cortados. A cortado is a five ounce beverage, which means you have to have a very controlled pour. Tulips are when you stack hearts on top of each other via a stop-and-start pouring motion. The final four competitors had to utilize oat milk to make a 12 ounce swan. The swan is the most intricate because it incorporates three latte art techniques: the heart, the rosetta and the tulip. After the winners were decided from their swans, the two finalists to move on to the final round were Daniel Mentado from Ground Support Cafe in SoHo and Juan Duque from Hungry Ghost in Prospect Heights, Brooklyn. The final round was a free pour, meaning the baristas could choose any latte art they desired, however, they had to use oat milk. They both chose tulips, and after a tightly contested final throwdown, Mentado pulled away with the victory. He took away over $100 in prize money, a decanter of cold brew and a dozen donuts. This was Mentado’s second win of the year already in competition, after he won Philadelphia at the beginning of the year. Reminiscing round by round, Mentado talked about his strategy. “[For the last round], I threw tulips because I call myself the #StackKing,” he laughed. Mentado added that he thinks barista competitions are great for coffee shops and bringing them together, because the coffee community in New York is huge. All the money Mentado won is going towards buying a La Marzocco Linea, his personal espresso machine. Duque, the runner up, has competed in latte art throwdowns a few times, and said each drink requires its own pouring technique. Like Corena and Mentado before him, he also spoke about how these events bring the coffee community together. In regards to independent coffee shops, there can be rivalry, but since a lot of the baristas in New York City have participated in competitions together before, they now even ride to throwdowns together. Kathryn Corena hopes that this throwdown was just a pilot and that there will be more in the future. She also hopes it can become a circuit and to collaborate with other coffee shops to coordinate more events. The throwdown was sponsored by Oatly Milk, Irving Farm which had baristas compete, and are the coffee provider for First Village and Barista Magazine.